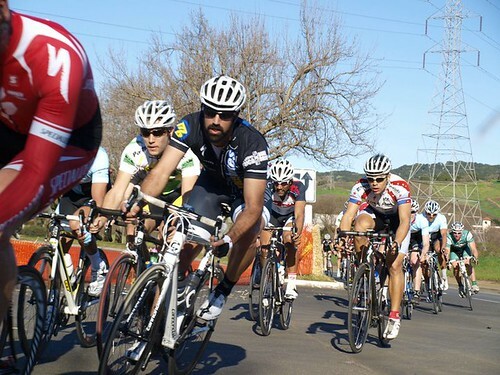 Sunday was just delightful, Shawn and I headed out to Napa really early and saw off some of our friends in the junior race, which was a field chock full of up and coming talent. Great to see the kids progressing (and good recon of those twerps for when I face them later in the day in the P/1/2 race). I set up shop on top of the little hill where you can see nearly the entire racecourse, and had a bunch of friends, teammates and so's join me for spells. My first attempt at Ryan's magic breakfast rice was successful and powered my mornings spectating and poor yet spirited dancing. Our cat 4's had a good race, unfortunately Bex got involved in a spill and while he was ok, he just missed the free lap rule and was unable to reenter the race and tear everyone's legs off on the bell lap. Ryjo pulled a 10th-ish finish and looked comfy out there. 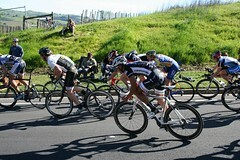 Paul and Keven were all over the front end of the race for the second day in a row and rode efficiently. They were just a bit off from closing the deal, with Keven in the top 10 again and Paul just behind. Its just a matter of time till these two strong riders sniff out just the right timing and tactics to notch the Mike's Bikes team some wins. By the time that race ended I was digging deeper into the picnic basket for some sandwiches, bananas and other snacks, starting to get anxious to throw on my own kit and start warming up. Finally it was time and I rallied Shawn to kit up and get a warmup going. It was definitely getting windy and I noticed I felt a lot better warming up with the aid of a tailwind! Did a few sprints to open the legs up and felt solid. Dibble and Studley arrive and we are all smiles. Get to the line to see a good sized field (80+) We went in without much of a plan except to use Shawn early. He did a great job watching the front end of the proceedings early on and can be seen pictured off the front tailing the likes of Mike's Bikes Berkeley employee and Yahoo! strongman Nate English. Tyler took the reigns from there and got into the mix in some of the days failed breakaway attempts. The reversed wind (from most years on this course) played out in a fast yet clumping type race for the P/1/2 field and nothing got very far up the road despite some strong riders digging hard. In the end the race came down to an unorganized and chaotic bell lap where Nole had a strong effort and can be seen building the confidence to sprint with the big names. We already know he can produce the speed! The podium was made up of Logan Loader, Fast Freddie Rodriguez, and Sam Bassetti. 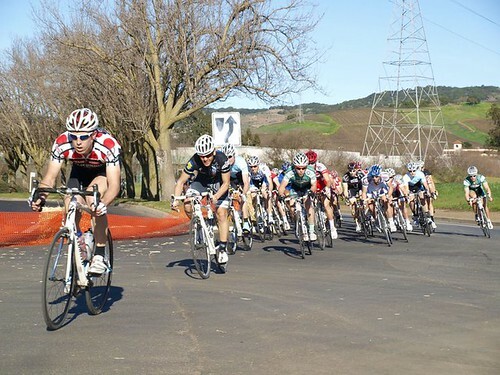 Gotta love NorCal, where else can you get your arse handed to you in an office park crit by a former ProTour star for a mere $30?! Can't wait to get a few more weeks good training in the legs and some of our strongmen off the IR. Gonna be a great inaugural season for Team Mike's Bikes. Older PostOur New Specialized Prevail Helmet!